If there is one thing that our kiddos occasionally have in common with wild animals, it is... Well, actually, there are probably a lot of things they occasionally have in common, come to think of it. But, if we had to choose one, we would say that they can go from darling to dangerous just by the click of a switch! In fact, that reminds us a bit of the Feisty Pets. These adorable furballs look like they just need a nice cuddle. But, they can turn pretty vicious in no time! What would be more perfect than a two-in-one mask!? Let your kiddos show off their puppy snuggle and their bark in one accessory with this Sammy Suckerpunch Feisty Pets Movable Mask. This fuzzy mask shows off the sad and please-pet-me face of the original Feisty Pet doggo. But, with a simple move, that adorable face turns into a growling menace! 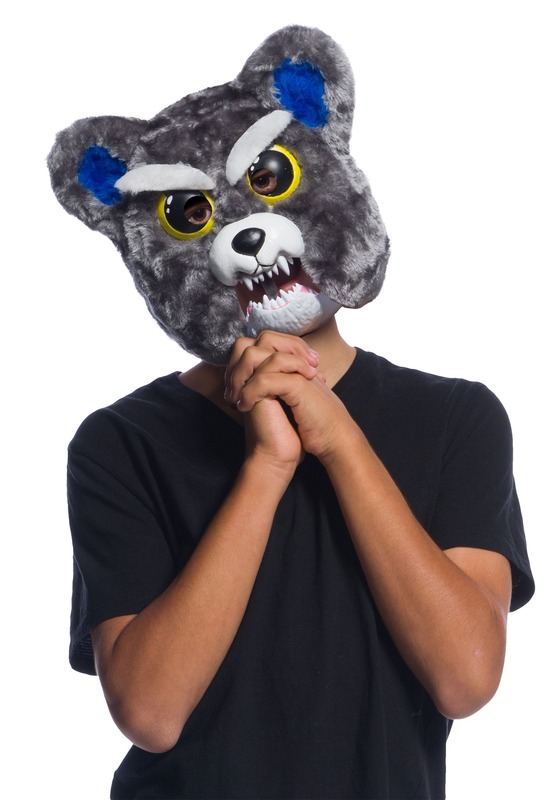 Let them surprise and delight their friends with this mask by itself or as part of a mischievous puppy costume. WATCH OUT WHICH PETS YOU PET! When they taught us all to be careful how we approach pets, they certainly had these feisty pets in mind! Going from happy to hungry in a snap, this Sammy Suckerpunch Movable Mask is the perfect way to let your tykes let their fur fly.